Solderdude’s measurement shows the very audible 8KHz peak that InnerFidelity’s graph didn’t show. 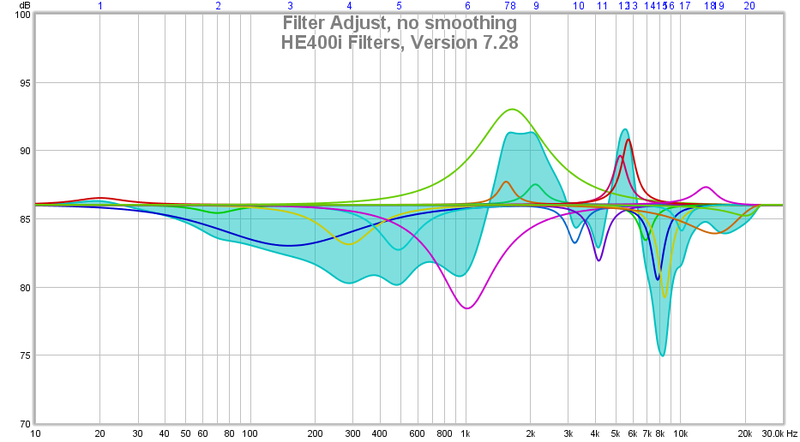 According to the graph above, the corrected frequency response is ±1dB from 20Hz to 13KHz, but the actual effect will be different for each person using this correction due to individual HRTF differences. However, an approximately neutral frequency response is assured. Since frequency response and impulse response are interrelated counterparts of each other, modifying the frequency response using an equalizer inevitably changes the impulse response. 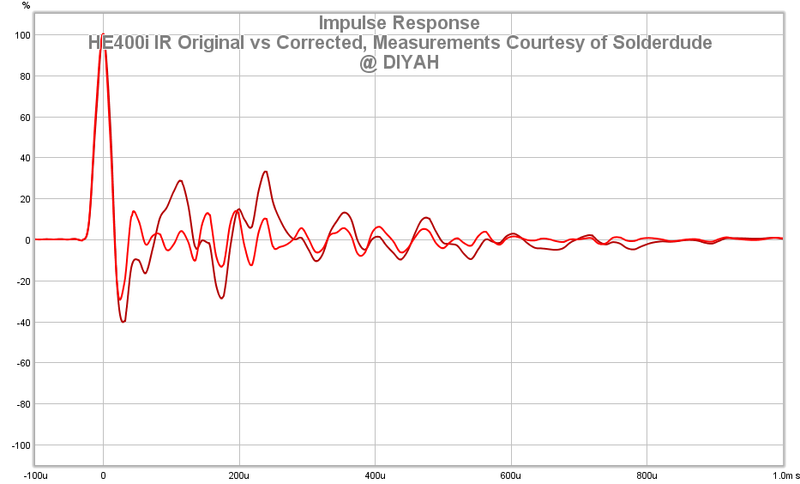 The corrected impulse response has less reverb and is more ideal. This is a graphic representation of the parametric filters. Extremely sharp boosts and cuts are avoided. The 8KHz sibilance edge is gone. Soundstage has expanded and imaging is more precise. 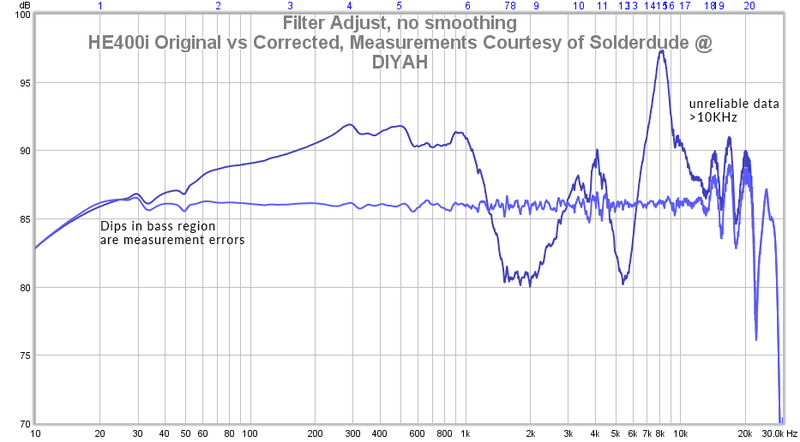 DRC cannot avoid automatically correcting the >13KHz region of unreliable measurement data. This could make the sound worse than it originally was. DRC tries to extend the bass way down below 10Hz, causing unnecessary subsonic rumble. DRC shows no significant quality advantage over REW in this case of headphone measurement. Convolver wave files – stereo 24bit 44.1KHz – 192KHz. This method is strongly recommended. You can load the convolution files into Foobar2000 Impulse Response Convolver, Equalizer APO or any other convolver. If you want to use other parametric equalizers (not recommended), refer to the values in these configs. Room EQ Wizard REQ file if you want to modify my equalizer setting to suit your taste. 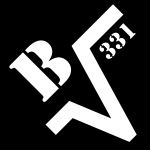 Graphic equalizers are not supported due to their fixed-frequency/bandwidth nature. Thanks for all the work! I’m a bit confused though. Is the equalizer set to Parametric EQ or Graphic EQ? 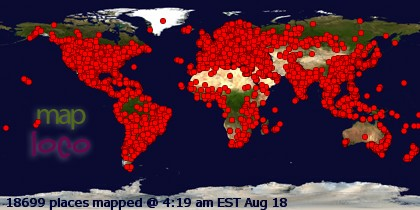 After ABing the two, I found the Graphic EQ to be less veiled are more engaging to listen to. using amarra for tidal and used your post to approximate the eq curve – albeit visually. Very impressed with the results. I never knew what frequencies were killing me sibilance-wise. helpful indeed. my sincere thanks, man! Is your Hifiman HE-400i the newer version with 2.5mm connector and without the backplate? Hi Brad, thanks for the config. Can you confirm that I remove everything in the Equalizer APO and then add the Convolver wave file? Or don’t i need to removethe standard pre-amp and config.txt? How to use the file ? can i have any guide?